When American Crime Story: The People v. O.J. Simpson was first announced, flying suspiciously under the now-franchised banner of Ryan Murphy's American [Whatever] Story, the perceived association with its pseudo sister show was difficult to ignore. Here was a dramatized retelling of perhaps the most sensationalized murder trial in American history and it was being overseen by the creative personalities responsible for putting Jessica Lange in a powder blue suit to Teutonically sing 'Life On Mars'. The implication of the series packing a grander sense of luridness than perhaps actually occurred was very real, as though the epic lunacy of the O.J. Simpson trial, the foaming-at-the-mouth media coverage, the inane Dancing Itos were all just part of a gauntlet thrown down two decades before, challenging the inevitable TV dramatization to a battle of gross exaggeration. It is with great surprise (and no small amount of relief), then, that the folks behind this 10-episode exploration of celebrity and race and murder (pretty much in that order) largely refused to take the bait. American Crime Story: The People v. O.J. Simpson brilliantly walks a fine line between sensationalism and dramatization. Adapted from Jeffrey Toobin's book The Run of His Life: The People v. O.J. Simpson by Scott Alexander and Larry Karaszewski (The People vs. Larry Flint, Man on the Moon) the series is less about perceived notions of Simpson's guilt or innocence, than it is about the specific social, racial, and even economic factors that, swirling together in the melting pot of a mid-90s Los Angeles just three years removed from the Rodney King verdict and the devastating aftermath of the riots, contributed to the acquittal of Simpson for the murders of Nicole Brown Simpson and Ronald Goldman. The first images of the series are not a bloody glove, a white Ford Bronco, a crime scene photo, or any other paraphernalia come to be associated with the trial in the decades since. Instead viewers are greeted by the grainy video footage of Rodney King being beaten by Los Angeles Police Department officers, followed by news coverage of the riots that erupted after the four officers were acquitted a year later by a mostly white jury. These images are reminders of just how fresh the wounds of the riots were, but they also serve as an effective framing device for the series itself. Positioning the staggering media attention of O.J. Simpson's impending trial against the backdrop of a still-simmering community divided across racial lines sets the stage for the defendant's acquittal, and serves as an effective prompt for how the trial ended the way it did. There is a bit of hindsight calculated into this particular viewpoint, but rather than offer the sort of scold-y "I told you so" retrospection of something like, say, The Newsroom, American Crime Story uses it as the scaffolding from which the narrative bricks and mortar of race, fame, media manipulation, and curated personas are laid, erecting a surprisingly sound structure capable of housing not only the enormous ruckus of the case against Orenthal James Simpson, but also the immense personalities that would soon become synonymous with the trial. To that end, American Crime Story is unable to refuse the allure of Hollywood spectacle and the business of star wrangling in an effort to secure more eyeballs in the following weeks. The series boasts Academy Award-winner Cuba Gooding Jr. as O.J., American Horror Story alum Sarah Paulson as the admittedly perfectly cast Marcia Clark, David Schwimmer as Kardashian paterfamilias and Simpson confidant Robert Kardashian, and, of course, John Travolta as Simpson attorney Robert Shapiro (one-fifth of the Simpson "Dream Team" comprised of Johnnie Cochran (Courtney B. Vance), F. Lee Bailey (Nathan Lane), Robert Kardashian, and Alan Dershowitz (Evan Handler). The series has also called in a few notable names for flashy supporting roles, like Connie Britton as Faye Resnick and Selma Blair as Kris Jenner. Travolta's presence is the series' own bit of carefully manufactured influence; he is the essence of exaggeration, from his eyebrows all the way to his affectedly deliberate speech patterns. Travolta's job is as much to draw attention to the series by saying, "Hey, look who's in our show," lending star power to a "limited series" presumably the same way the idea of "star power" supplemented the first seasons of True Detective or FX's own Fargo. 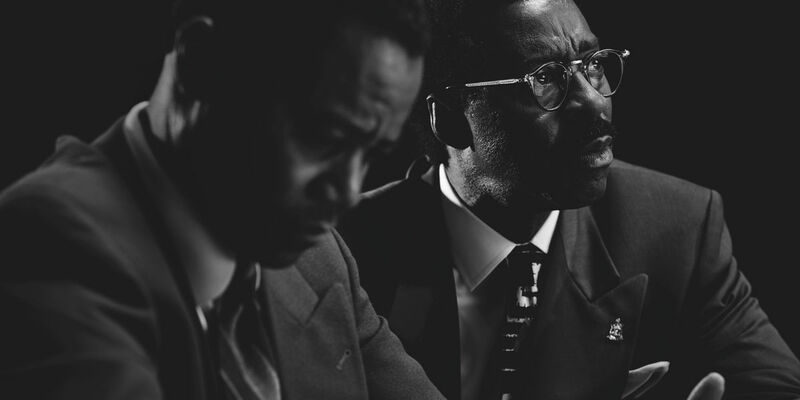 As much as Travolta or Gooding Jr. are the headliners in this case, the first hour – and many moments of the hours to come – belong largely to Courtney B. Vance's brash Cochran. Vance seemingly does the impossible: he wholly embodies the role, maintaining a consistent, compelling character without devolving into caricature or mere mimicry. In the early portions of the series, his Cochran hovers around the increasingly expansive perimeter of O.J. 's defense, spouting observations that feel prescient (in a way that avoids being categorized as mere hindsight on behalf of the writers) due in no small part to the way Vance convinces everyone – co-star and viewer alike – that this character is less man and more force of nature. As surprisingly measured as the proceedings are during the first hour, there's no denying the appeal of certain artifacts lingering in the periphery of the series' primary focus. How could a show exist in 2016 without acknowledging the presence of the Kardashian sisters and their mother at each and every opportunity? There's a wonderfully sleazy moment when attention is called to Faye Resnick and Kris Jenner after the latter calls out her children's names at the funeral for Nicole Brown Simpson. Britton and Blair are at their tabloid-y best; smartly operating at the opposite end of the spectrum that Vance, Paulson, and Sterling K. Brown's Christopher Darden are working from. But the delightful trashiness of the moment isn't just the series turning into the scandal sheet skid of tangentially related celebrities; it's rather another smart observation on the legitimizing power of fame and the way public perception can be controlled if directed by skilled enough hands. Ryan Murphy, who shows remarkable control in handling the delicate nature of a miniseries constantly tempted by the base nature of its subject matter, directs the first two hours of The People v. O.J. Simpson. In the past, Murphy has seemingly been motivated by a desire to provide more of what his critics wanted less of. To his credit, this is not the case here. Instead, he spends the first two hours building a solid foundation for what's to come – director John Singleton, most notably – and establishing a strong center to a series that must balance the sensationalized account of the trial and its own desire to account for that sensationalism without the show itself becoming the wrong sort of sensation. American Crime Story: The People v. O.J. Simpson continues next Tuesday with 'The Run of His Life' @10pm on FX.